NASA Goddard Space Flight Center is home to the nation’s largest organization of combined scientists, engineers and technologists that build spacecraft, instruments and new technology to study the Earth, the sun, our solar system, and the universe. 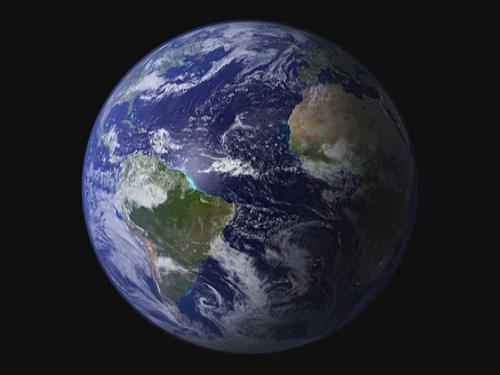 Animation of NASA’s Blue Marble. Credit NASA Goddard Space Flight Center Image by Reto Stöckli (land surface, shallow water, clouds). Enhancements by Robert Simmon (ocean color, compositing, 3D globes, animation). Data and technical support: MODIS Land Group; MODIS Science Data Support Team; MODIS Atmosphere Group; MODIS Ocean Group Additional data: USGS EROS Data Center (topography); USGS Terrestrial Remote Sensing Flagstaff Field Center (Antarctica); Defense Meteorological Satellite Program (city lights). This spectacular “blue marble” image is the most detailed true-color image of the entire Earth to date. Using a collection of satellite-based observations, scientists and visualizers stitched together months of observations of the land surface, oceans, sea ice, and clouds into a seamless, true-color mosaic of every square kilometer (.386 square mile) of our planet. These images are freely available to educators, scientists, museums, and the public. This record includes preview images and links to full resolution versions up to 21,600 pixels across. Much of the information contained in this image came from a single remote-sensing device-NASA’s Moderate Resolution Imaging Spectroradiometer, or MODIS. Flying over 700 km above the Earth onboard the Terra satellite, MODIS provides an integrated tool for observing a variety of terrestrial, oceanic, and atmospheric features of the Earth. The land and coastal ocean portions of these images are based on surface observations collected from June through September 2001 and combined, or composited, every eight days to compensate for clouds that might block the sensor’s view of the surface on any single day. Two different types of ocean data were used in these images: shallow water true color data, and global ocean color (or chlorophyll) data. Topographic shading is based on the GTOPO 30 elevation dataset compiled by the U. S. Geological Survey’s EROS Data Center. MODIS observations of polar sea ice were combined with observations of Antarctica made by the National Oceanic and Atmospheric Administration”s AVHRR sensor—the Advanced Very High Resolution Radiometer. The cloud image is a composite of two days of imagery collected in visible light wavelengths and a third day of thermal infra-red imagery over the poles. Global city lights, derived from 9 months of observations from the Defense Meteorological Satellite Program, are superimposed on a darkened land surface map. Strobist info: one sun @ absolute magnitude of +4.83 bare camera left triggered via Cybernature. que la tierra no gira hacia el otro lado? i think that the earth spins to the other side, the sunset is in the west or am i wrong? If you lived here you would be home now. Restart your computer and browser, pebble_garden. There is no stuttering at all in this. Also, you can click the widget to see it full screen. This is an awesome image, all the more so because it’s REAL, and it looks exactly like all the drawings and maps which have been done over the years. I still find it amazing that those cartographers from hundreds of years ago actually got it right – after all, they couldn’t exactly go into outer space and check it out for themselves. An instant fave, which I shall enjoy revisiting. Wow Brasil really is bigger in size than Australia. Never looks that big on maps. amazing how you can see the reflection of the sun off the ocean..
Um, yawn? This is the driver’s-license photo version of what should be a *spectacular* animation. And it would be nice if the animation didn’t stutter, but hey, I’m picky. Ah if the stuttering is on my end, then mea culpa. Still. the animation could be far more exciting. Beautiful image and it’s a beautiful shot and nicely presented. well done. DO YOU KNOW, OUR DEAR EARTH IS SPINNING, AND SPINNING NON STOP, CLICK , TO VISIT AND VIEW IN MY GALLERIES. 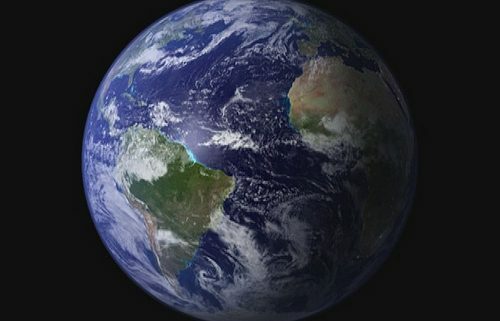 And here is my version; This is the way I think the earth looks like… of course, I have never seen it with my own eyes, this is my guess based on my short physics knowledge. Y aquí está mi versión, usando los mapas proporcionados por la NASA; Por supuesto, no he visto el planeta desde el espacio, pero deduzco que así se debe ver. This is absolutely awesome, and I agree with everything else that’s already been said. lindo demais, principalmente porque não se consegue ver a destruição causada pelo homem! amazing. absolutely amazing. thanks so much for sharing your work. Fantabulous imaged. very interesting. Thank you dear friend.